Surrounded by parklands and river reserves, Rapids Landing is focused on prioritising its sustainable initiatives. An environmentally-friendly future, for both the region and the current and future generations, is the desired outcome of the practices Rapids Landing is engaging with. Since its development, Rapids Landing has earnt a place among the most environmentally pro-active land developments in WA. The Estate boasts a modern approach to sustainability and design, and provides a family-focused community in which fresh, clean air and native surrounds are enjoyed by all. Through the use of productive planning, community support and benchmarking initiatives, Rapids Landing’s sustainable developments in place are focused on both preserving and respecting the region’s natural resources, as well as water-saving initiatives that are turning the tide on water consumption throughout our nation. The Estate also provides a perfect example of how architectural design and natural resources can be combined to create a modern development that is both sustainable and respectful to its land. The marri tree was one to grow in the former paddocks in the area and is hence still celebrated here. 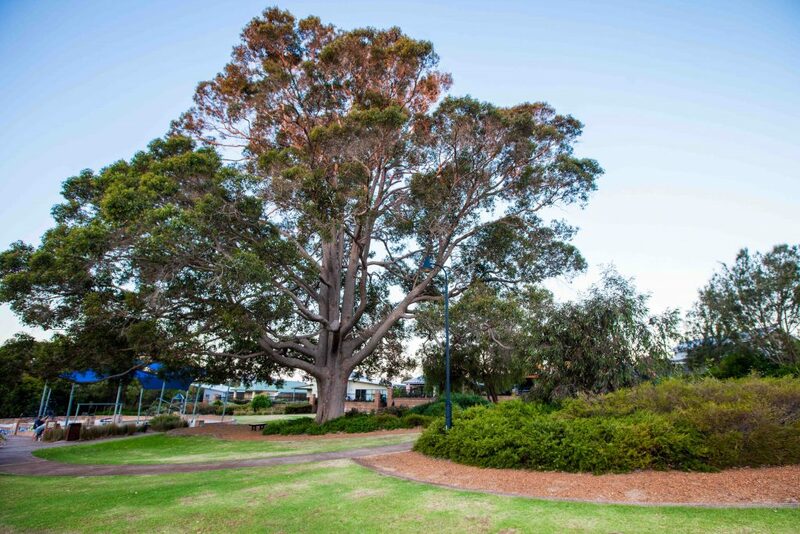 An entire park and surrounding residential lots were designed around the stoic tree, making it a significant feature and a local landmark of Rapids Landing.